Busshinji, Sōtō Zen Buddhist temple in Liberdade, São Paulo, is the headquarters for the school's mission in South America. With nearly 250,000 Buddhists, Brazil is home to the third largest Buddhist population in the Americas, after the United States and Canada. Buddhism in Brazil consists of practitioners from various Buddhist traditions and schools. A number of Buddhist organisations and groups are also active in Brazil, with nearly 150 temples spread across the states. Buddhism was introduced to Brazil due to the immigration of Japanese in the early 20th century. Thus, Japanese schools and sects of Buddhism, such as Soto Zen, Nichiren Honmon Butsuryu Shu, Jodo Shinshu (also known as True Pure Land Buddhism) and Soka Gakkai have a strong presence in Brazil. Despite being the most expressive in Brazil, these schools face a number of challenges which limit their influence and outreach. One of those challenges is the mismatch of goals and expectations between the more traditional, Japanese-born people and the native Brazilians alongside those of Japanese descent. Although the Japanese contributed to the introduction of Buddhism to Brazil, adherence to Buddhism is not particularly widespread among descendants of Japanese immigrants, who were largely converted to Roman Catholicism. Those who practice and identify with Buddhism tend to display a wide variety of stances regarding their relationships to the ethnicity and the religious tradition. To various degrees most of them attempt to simultaneously meld with local Brazilian culture according to their personal preferences. Most such schools are attempting to reach out to Brazilians not of Japanese descent, however often facing considerable internal resistance in the process. Other Japanese traditions present in Brazil include Shingon, Tendai, Nichiren-shū and Nichiren Shōshū schools, albeit in somewhat modest numbers. Recent years also saw a growth of interest in the practice Zen variants from Korea and Vietnam in Brazil. The Theravada tradition's presence in Brazil was started by those who created the Brazil Buddhist Society. It was initially presented with a generalist non-sectarian approach to Buddhism, it evolved into a more Theravada-aligned society drawing teachings from the Pāli Canon of the Tripitaka and to other teachings and practices of the Theravada tradition. Since the 1970s it has maintained simple installations built with voluntary work which have hosted visiting monks from Sri Lanka and other Theravada countries. In 1989, the Nalanda Buddhist Centre was established. It maintains affiliated groups in Rio de Janeiro, Belo Horizonte, São Paulo and Curitiba, and has invited a large number of international teachers through the years. Tibetan Buddhist temple in Três Coroas, Rio Grande do Sul. All four major schools of Vajrayana Buddhism, Nyingma, Gelug, Sakya and Kagyu schools, maintain active centers in Brazil. 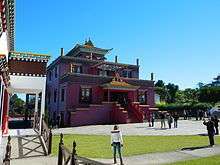 Chagdud Tulku Rinpoche relocated the headquarters of his international organization to Três Coroas in Rio Grande do Sul State where he spent the last few years of his life. The 14th Dalai Lama visited Brazil in 2006. The Chinese Chan school and Mahayana Buddhism is centered on the city of Cotia's Zu Lai Temple and its companion Buddhist University in São Paulo State, both of which were opened in 2003. The temple, near the city of São Paulo, is the largest temple in Latin America, and was built using funds raised from American Buddhist organisations and donors. The Fo Guang Yuan Temple in the city of Olinda, in the northeastern state of Pernambuco, also belongs to the Mahayana tradition. 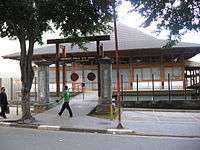 The Vietnamese Zen school of Thich Nhat Hanh maintains temples and sangha in the cities of São Paulo and Rio de Janeiro. Although Brazil remains a largely Christian country, Buddhism has a growing presence in Brazil. There is considerable online activity and dialogue amongst Brazilian Buddhists, with a number of websites and online groups, as well as Orkut communities dedicated for discussion and clarifying doubts about Buddhism and Buddhist teachings. The activities of Buddhist groups are however a bit restricted due to the linguistic geography of Brazil - since it is a non-Spanish speaking country in Latin America. This limits the cross-boundary activities typical of the Buddhist organisations active in other countries. The State government of Espírito Santo has implemented a special training programme for military police to attend zen courses at the Mosteiro Zen Morro da Vargem. ↑ "Archived copy". Archived from the original on 2009-05-31. Retrieved 2009-05-17.